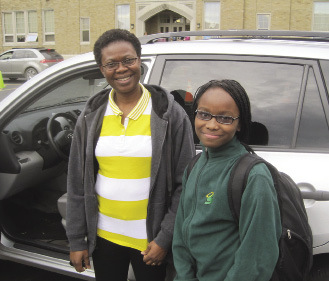 Omobolade Ademoyo picks up her daughter, Imisioluwa, after school. The family chose St. James School for its academics, as well as faith and family values, after arriving in the U.S. from Nigeria. family. In the end, the family chose St. James School in Johnson City, NY. as a result, the students excel. The Ademoyos are a prime example of immigrant families seeking the opportunities this country has to offer in the form of Catholic education. Many of the Catholic schools in the Syracuse Diocese have seen an increase in interest from this diverse population, which traditionally considers academic success a top priority but also seeks a safe and disciplined environment along with a welcoming student body. “I visited Bishop Grimes and felt comfortable and safe, and I felt that I could focus on my education,” said Jordanie. 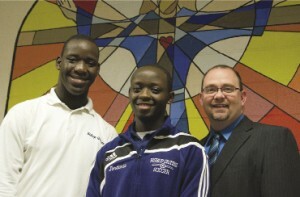 Immigrant students like brothers Joe and Jordanie Hakizimana, who were born in Congo, are welcomed into our Catholic schools. They are pictured with Marc Crouse, principal at Bishop Grimes Prep. Once he arrived at Grimes, however, the young man found the courses to be much more difficult than at his previous school. He attributes much of his success to his resource teacher, Susan Boone, and Susan Nedza, director of guidance, who helped him catch up. “Without them, I wouldn’t be here,” he said. Principal Marc Crouse believes the brothers’ presence at the school has enriched the lives of all Bishop Grimes students, who have had the opportunity to learn about the traditions and customs of Africa, as well as important lessons in the tolerance and understanding of people from different cultural backgrounds. Claudia Mathis is a freelance writer with the Catholic Sun. « Young Musicians Program Fosters Talents, Builds Community at C.A.P.